The following is a running list of past events that were posted to the SPON calendar in 2018. The reception starts at 5:15 p.m. The program, focusing on solutions to the homeless problem, is a follow-up to an April forum outlining the problem. Note: The hearing notices for this meeting were not published as planned. As a result it will need to be rescheduled. The new date has not yet been determined. This meeting of SPON’s independent General Plan Update Advisory Committee will continue the guest speakers series. Kevin K. Johnson, an environmental lawyer from San Diego will provide insights on how to more effectively read and comment on Environmental Impact Reports. 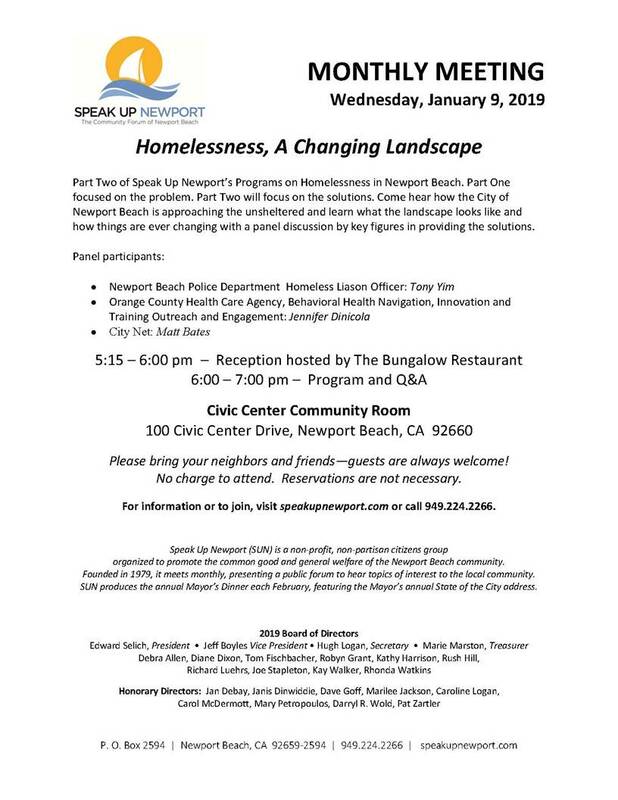 Click here to RSVP – The event is free and open to all, but these are popular events and we need to know your plans so we don’t exceed room capacity! The Lower Sunset View Park contract requires Council approval as it involves hiring former City Council member Tony Petros as the “sole source” coordinator for the public outreach and design effort for $48,500 over an 29 month period. Early each year, the Council holds a “retreat,” usually on a Saturday morning, at which it discusses and tentatively selects its goals for the rest of the calendar year. Confirmation of Mayor’s selections for five-member General Plan Update Steering Committee. The selections are Nancy Gardner (Chair), Ed Selich, Debbie Stevens, Larry Tucker and Paul Watkins. Note: SPON has some concern with these selections. Despite their long histories of service to the City, all the designees, with the exception of Debbie Stevens, were on the review committee (“LUEAAC“) that brought us Measure Y — the ill-fated previous attempt to update the General Plan, rejected by 69.3% of voters in 2014. The inaugural meeting of the General Plan Update Steering Committee (to be appointed on February 12) will double as community outreach event (see News Splash, calendar announcement and flyer). Overview and discussion of the General Plan Update process. Review and discussion of the Request for Proposals for an outside consultant to guide the effort. Note: the five Steering Committee members attended, but did not participate in this event, supposedly because they had not been sworn into office. The inaugural meeting of the General Plan Update Steering Committee, which had been announced for February 13, has been rescheduled to February 20, supposedly due to the committee members not being able to participate on on February 13 because they had not been sworn into office. The February 13 meeting devolved into a staff presentation to community members with the yet-to-be-sworn-in Steering Committee members listening from the audience. Introduction of residential street construction parking ordinance (also restricting Saturday activity and requiring new construction fence signage). March 6 @ noon: Deadline to submit applications for appointment as one of the two additional citizen members being added to the General Plan Update Steering Committee. Applications received by the deadline will be considered in addition to those submitted in connection with the original recruitment. Review draft of a new Request for Proposals for a consultant for the “listen and learn” (public outreach) phase of the process, only. City staff’s Annual Status Report (Planning Activity PA2007-195) on the state of the City’s General Plan Update Implementation Program and its progress on the Housing Element goals. Waiver of Council Policy L-6 for encroachments into public right of way at 3100 Breakers Drive. Approve letter to County Supervisors stating City’s preferred alternative for JWA General Aviation Improvement Program. Possible completion of revisions to the RFP for an outside consultant to manage the “listen and learn” phase of the GPU process, only. Presentation about the Harbor Commission’s visioning process. Presentation from staff about updates to the City’s website. As part of the Deputy Director’s Report for Orange County (Item 15), the Irvine Company is asking for a one-year extension of the previously-granted permit to build a 25-foot tall, 14,252 square foot restaurant in the parking lot of the former Reuben E. Lee paddleboat restaurant (2012 E. Coast Highway) adjacent to PCH’s Back Bay Bridge. The project includes a new public dock. This was originally approved as Item Th10b on February 9, 2017. Note: this is being noticed as a “Special Meeting”. The agenda appears after the agenda for the Regular Meeting at 5:00 p.m. The Airport Commission is expected to review and make a recommendation regarding the EIR and project alternatives for the General Aviation Improvement Program. Their recommendation is expected to go to the Board of Supervisors on April 23.